In this tribute to Lindsay Cooper written specially for the WLMA, accompanied by a portrait kindly shared by another friend, Val Wilmer, Maggie Nicols shares her memories of the late great musician and composer. I first met Lindsay in the early ‘seventies, when she was working with the radical ‘Ritual Theatre’ and I was running music workshops. The location was the pioneering community arts centre ‘The Oval House’, in South London run by Peter and Joan Oliver. Lindsay came with some of the theatre group, to one of my workshops It was too long ago to remember details and I didn’t think at the time, these memories are going to be important one day. I do remember Lindsay as innocently flirtatious and me as a bit nervous about that. I only knew the sixties butch fem scene & Lindsay was not either and it confused me. This was before I became exposed to feminism. Lindsay was a feminist before me but we both shared a commitment to socialist politics. I had joined the Socialist Labour League and she was in the political and radically musical rock band ‘Henry Cow.’ Our paths crossed from time to time and, as we were both active in the Musicians Union, we would see each other at branch meetings and hang out a bit. It wasn’t till I became involved in The Women’s Liberation Movement in 1976/7 that we developed the close friendship and musical and activist collaborations that lasted decades. Up to then, all my intimate musical experiences had been with men with one notable exception, my dear musical soul mate, singer Julie Tippetts. Through becoming involved in a relationship with a lesbian separatist, I found myself in this rather overwhelming and a bit scary women only world, centred round a couple of streets of women’s squats in Vauxhall. It was around that time I attended a ‘Music For Socialism’ event in which the only female musician was singer Carol Grimes. Emboldened by my new exposure to women’s liberation, I confronted the organisers about this and they suggested I get a women’s group together!! At the next M.U meeting, I excitedly approached Lindsay Cooper. I think I wanted to show off a bit that I was now a bona fide lesbian feminist and no longer nervous of her. Together we set about gathering together women for our group. At that point, I only knew one female instrumentalist, trumpeter Corine Liensol, who I’d met at one of the squatted houses in Vauxhall. She was well up for it and had no qualms about improvisation. We decided we would be a women’s improvising group; open to all women musicians who were open to improvising musically. Lindsay had worked with cellist and bass guitarist Georgie (Georgina) Born in ‘Henry Cow’ and also knew singer and pianist Cathy Williams from the political rock scene. I told the organisers of the next Music For Socialism event that we were ‘The Women’s Improvising Group.’ To our surprise, the publicity leaflets named us as ‘The Feminist Improvising Group’ and we sort of went, you want feminism, we’ll give you feminism. We met and workshopped ideas. Lindsay was wonderful in that first gig. Dressed in prescribed classical music attire, she brought a whole array of props, including a washing up bowl, onions and perfume spray to get rid of the smell of onions! We improvised our lives: a radical form of music theatre that embodied the feminist principle ‘the personal is political’ We both enthralled and appalled audience members and the public discussion that followed was lively to say the least. For the next few years FIG revolutionised improvised music and made it accessible to a much wider audience. One of my abiding memories, which was filmed but by whom I cannot remember, was when Lindsay and I got so carried away, in a gig abroad, somewhere, that we occupied the gents toilets and would not let the men enter. We stayed there for the whole of the break and then did a three legged ‘race’ back on stage, using Lindsay’s sopranino sax as one of the legs. In its prime, FIG was anarchic and musically adventurous. We shapeshifted between intricate musical passages, biting satire and unashamed slapstick humour; a social virtuosity of mixed ability. 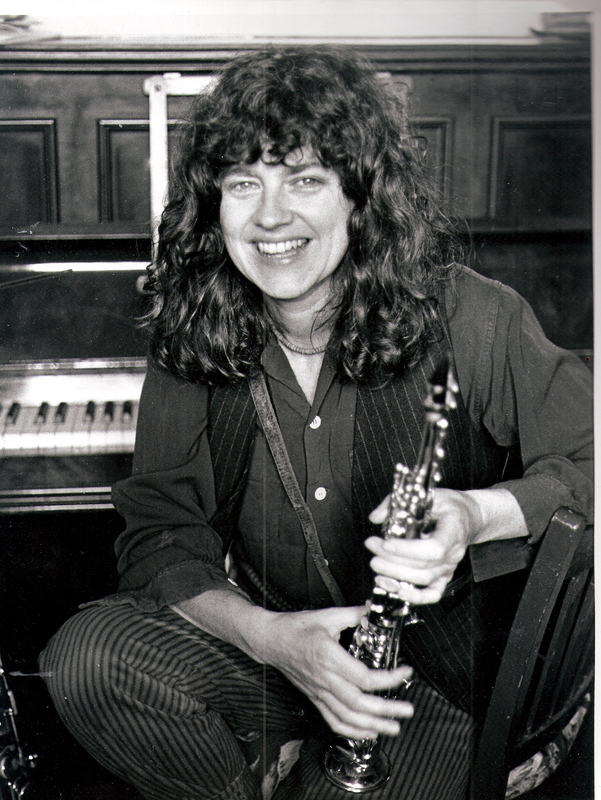 Quite a few women were involved with FIG, including pioneering improvising pianist Irene Schweizer, trumpeter Corine Liensol, vocalist and keyboard player Cathy Williams, saxophonist Angele Veltmeijer, trombonist and violinist Anne Marie Roelofs, guitarist Francoise Dupety and singer Sally Potter. Singer Frankie Armstrong also joined us for a couple of gigs. When FIG disbanded Lindsay and I continued to play together and hang out as friends. We used to discuss our Piscean tendencies to go off into ‘lulu land’ when we became enamoured with someone. We shared many confidences. We also continued our union activism. We were instrumental in putting radical motions up at union meetings which challenged sexist attitudes and practices and were delegates at the conference where we also danced intimately together at the social just to get some of the other delegates a wee bit off balance. We were in a lot of different music groups together. With double bassist Joelle Leandre, we made the album ‘Live At The Bastille.’ It was the anniversary of Bastille day and we played there, in Paris. We also played in Irene Schweizer’s EWIG, European Women’s Improvising Group and then as part of an initiative by Anne Marie Roelofs, ‘Canaille’, several festivals of different large ensembles of women improvisers from all over the world, playing in different combinations, mainly in venues in Germany. Out of these combinations came some ongoing groups, including ‘Al Dente’ with Lindsay, me, pianist Elvira Plenar and accordionist Michelle Buirette. The name came from a running ‘sketch’ that Lindsay and I loved to act out about how we liked our spaghetti. On Facebook, on hearing of Lindsay’s death, violinist Susannah Ferrar remembers a long car journey abroad in which Lindsay and I kept this up for quite some time. She says it was very funny. Another recurring gag was how Lindsay would longingly say that she wished she could study with Andrew Lloyd Webber and I would say how then she would become a proper composer. I remember, one time, standing opposite The Drury Lane Theatre where ‘Cats’ was playing and both of us pretending to swoon as we spoke in gushing tones of our ‘hero.’ In fact Lindsay was one of the most inventive and original composers of our time and I was lucky to sing many of her compositions. They are truly inspiring and great to sing. Until it was too difficult because of failing health, Lindsay would travel with us and sit in a wheelchair at the front while Phil Minton and I sang our hearts out and the band played the seamless diversity of her compositions. We also worked as a duo, once travelling to Prague and sharing some great music and experiences out and about in the city. Lindsay wrote extensively about her travels and I hope it gets compiled in a book. It’s warm, witty and excellent writing about her life as a musician on the road. She also wrote about her MS and what it was like to live with the disease. I remember when she told me she had decided to come out about having MS. She had lived with the knowledge of her illness for a long time. When we were on the road with FIG, she knew about it. Lindsay introduced me to her yoga class and I introduced her to my therapist! We both benefited enormously from those introductions. I saw a lot of her while I was still in London. We used to do collective practice, me at the piano, singing long notes and Lindsay playing bassoon or sopranino. Then the music happened less and less and it was talking about everything; love, politics, spirit, philosophy …. It’s strange when you see a lot of a person, you don’t notice the changes so much. It was only when I became more involved with supporting my daughter and then my mum in Wales and I saw less of Lindsay, that I noticed how her health was deteriorating. Mum moved to Wales in 2002 and my daughter and I were there most of the time. The gaps between visits to Lindsay grew longer: birthdays, Christmas and trying to see her whenever I was back In London. She moved from the place she loved, round the corner from Marchmont Street, because of the stairs and then she needed carers and then 24 hour carers and then she would be in bed watching the telly when I visited, although her carers assured me that she still sat in the garden in her wheelchair. They were brilliant. They genuinely cared about her and honoured her. Lindsay gradually lost the ability to speak and feed herself; yet always I sensed her fierce spirit, her determination to survive. Because I was seeing her less and less, I projected my guilt onto looks she gave me, thinking they were looks of anger. Luckily I let that go and our last visits together felt like peaceful meditations. A few weeks before she died, I phoned and the carer put on the speaker so I could talk to Lindsay. I’d asked if I could write and the carer had suggested I email and they would read it out. I said I’d rather write a letter. The carer said she would ask Lindsay which she preferred. With Sally Potter, they’d developed a way by which Lindsay would blink to indicate ‘yes’ or ‘no.’ Lindsay made it clear, she’d prefer a letter! Oh yes, that definitely felt like Lindsay; inspired writer that she was, an email sound bite would not suffice. For me it’s a bitter irony that I hadn’t thought to phone or write before. I thoroughly enjoyed writing to her and looked forward to writing regularly. There’d been a family crisis and everything else had been displaced. As things improved, I looked forward to visiting her when I next went back to London. I got a phone call from Irene Schweizer who’d had an email from Sally with the news of Lindsay death, then an email from a friend of Lindsay’s arrived. She’d managed to get my address. I am so sad I didn’t get to say goodbye. I didn’t know she was dying. Apparently she contracted pneumonia and her immune system was too weak to withstand any more invasive treatment. Her close friends rallied round. Sally was with her day and night in the last days of her life, supported by other friends of Lindsay’s. Lindsay’s funeral was beautiful; her music was played and people who knew her spoke of her with great love. Lindsay we had such laughs together and we also supported each other through heartache and encouraged each other’s growth. We had become so close and then circumstances deprived us of more time together. Thank you for those last peaceful visits and for wanting a letter from me. I would encourage everyone to find out as much as you can about this unique woman who was such a brilliant musician, composer, activist and thinker. Photograph of Lindsay Cooper copyright Val Wilmer. Not to be reproduced in any way without permission. Reblogged this on Feminist Music.